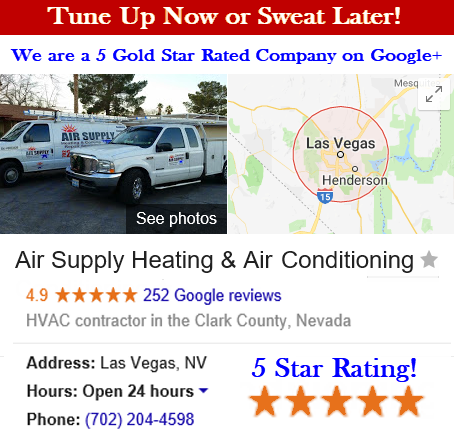 Air Supply Heating and Air Conditioning is a full HVAC system contracting service company, eager to service the commercial businesses and residential homes the Las Vegas, Nevada Valley. 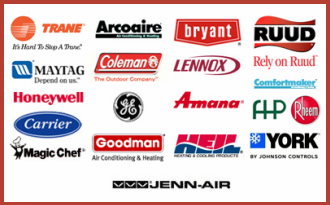 Being completely certified, licensed, and insured in all aspects of the HVAC services we offer, gives us the opportunity to deliver fast, affordable, efficient, and professional services to all our of valued customers. 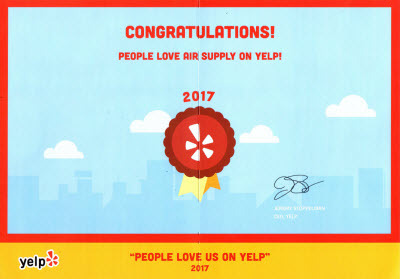 At Air Supply Heating and Air Conditioning our technicians have advanced and ongoing training, years of helpful experience, and extraordinary skills. We only utilize high-end products, tools, equipment, and supplies exclusively sold to licensed professionals to ensure premium results. At Air Supply and Air Conditioning you can expect high moral values, exceptional work ethics, friendly customer service, and superior executions on all services rendered to stand out among the competition. Air Supply Heating and Air Conditioning of Las Vegas, Nevada offers commercial air duct cleaning to businesses throughout the valley. We understand the complex nature of the air duct system of commercial air ducts. Just as homes are encouraged to get a routine air duct cleaning every so often, commercial air ducts should be cleaned as well to improve the indoor air quality, efficiency and longevity of your business’s air ducts. How Often Should You Clean the Air Ducts in Your Commercial Building? With the HVAC system consuming the most electrical energy in the building, over 39% overall energy use in an average size commercial building, your number one goal should be to defray costs and reduce carbon footprint. The more dirt and accumulative layers of filth the air has to bypass encourages the HVAC system in whole to compensate, with clean air ducts and coils, the air can move more freely promoting a more efficiently operating system. The fans within the HVAC system are able to push the air effectively, distributing the conditioned air faster, smoother; free of debris and allergy contagions. 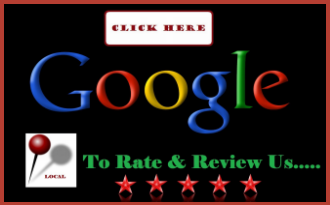 Air Supply Heating & Air Conditioning recommends a yearly inspection of your air ducts. If your building has undergone heavier amounts of dust or other harmful particles due to construction etc, its best to clean them more often. Contact our commercial air duct specialists for a free quote on duct cleaning services for your building! There is a number of health risks involved in poor indoor air quality that affects commercial buildings throughout the Greater Las Vegas, Nevada Valley. Those that suffer from respiratory issues such as asthma and allergies among others, and SBS – Sick Building Syndrome are all health risks that can be agitated by poor indoor air quality. SBS is generally attributed by a building’s ventilation inadequacy, as well as specific biological and chemical contaminants for example; molds, pollen, bacteria, and viruses. When the ventilation is poor the contaminates being ventilated with fresh air intake, the symptoms among employees and clients could manifest irritated eyes, nose, skin and throats and a list of other symptoms depending on the sensitivity of the individual. With a regular commercial air duct cleaning performed by Air Supply Heating and Air Conditioning, many of these issues can alleviated. In a nutshell, your Greater Las Vegas, Nevada commercial business will greatly benefit from an air duct cleaning by Air Supply Heating and Air Conditioning skillful team of professionals. We are experienced and well trained to properly utilize the specialized equipment necessary to ensure your commercial air ducts are thoroughly cleaned. Call Air Supply Heating and Air Conditioning of Las Vegas today to get started!